It’s Wednesday and therefore, time to point you in the direction of mannerly living. 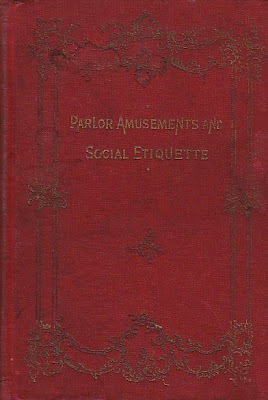 Recently, I got a little tome entitled Parlor Amusements and Social Etiquette. It was perfect because I had been wondering where I might find a book that would not only provide instructions on how to behave in church but also provide instructions on how to play a game of bouquet. I also wanted to know how to make New Years Day calls as well a bit of sleight of hand. And I desperately needed to know what causes deformed feet and how to put on a "Punch and Judy" play. Here was everything I needed to know in one little book. As a preliminary, it should be assumed that the right spirit has drawn the worshiper thither and that a reverent attention will be given to the service. 1. If possible, be in time. You need at least five minutes after coming to get warm or cool: to compose your body and mind, and to whisper prayers before the service. 2. Never pass up the aisle during prayer. 7. Never put on your coat, overshoes or wraps during the closing hymn. 8. There should be no loud talking and jesting after the service is concluded. And after a well behaved visit to church a rousing game of Bouquet! Each player composes in turn a bouquet of three different flowers, that he names aloud to the person conducting the play. The leader then writes the names of the flowers, and after them the names of three persons in the room. He then demands of the player who has composed the bouquet, what he intends to g do with the flowers, and upon their proposed disposition being declared, the names of the three persons they represent are read aloud. I don’t know about you, but I can’t wait to get my copy of the Wii version of the Game of Bouquet.